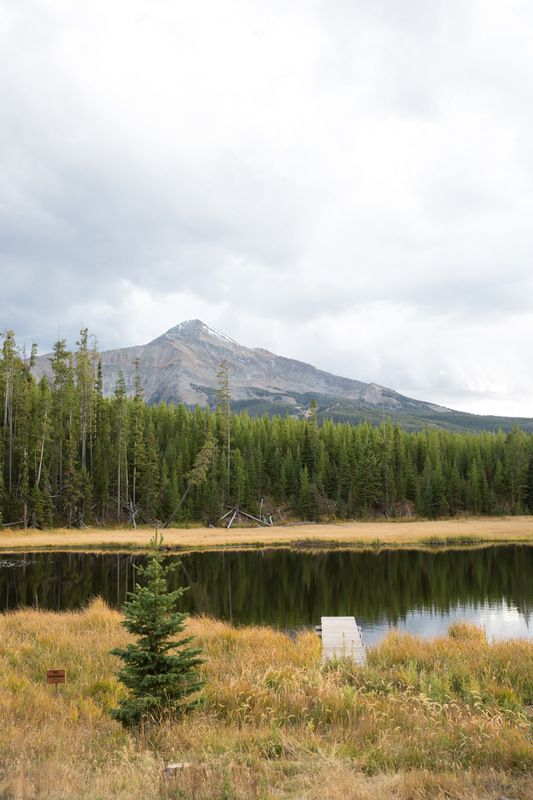 Stunning views of Lone Peak from Collective Retreats in Big Sky. Stacked firewood for those nightly campfires and s'mores. Every inch of Montana radiates undeniable allure; from the breathtaking landscapes in every direction, the brisk mountain air, and the all-around warmth shared by people who call this magnificent state home. From the moment we arrived in Bozeman, I was taken by the log cabin decor of the airport (fireplace included!) welcoming us into the "The Treasure State". We felt immediately transported into a Wes Anderson film at the lodge, a gigantic tent decked out with string lights, plaid blankets, and eclectic tchotchkes. Then, we were led along the marked path to our tent, passing the spectacular mirrored lake with the clearest views of Lone Peak cutting across the boundless sky. To say we adored our boho-meets-shelter-mag tent would be an understatement. No detail was too small here, from the Moonrise Kingdom-inspired decor to the mix of textured bedding and rugs that made it so cozy and warm. There were so many moments when we were torn between hunkering down in the tent or going outside to bask in the outdoor air. First things first, we settled in. We unpacked our snacks and stored them in the bear box provided behind the tent. (Apparently there had been a few bear sightings so we weren't taking any chances). We cracked open a couple cans of our favorite craft brews we discovered during the trip and lounged on the sheepskin rugs, alternating between admiring the decor inside and views outside over a casual game of Gin Rummy. Obsessed with the eclectic (and functional) decor on the side tables. Our favorite craft beer of the trip from Upslope Brewing Company in Boulder, CO.
Cards for the night ahead by the wood burning fireplace in the tent. Inevitably, there are questions about the bathroom setup at the site. We had own bathroom, directly behind the main tent that might be the most picturesque "outdoor" bathroom ever. Again, all about the details. Yes - this is the bathroom, housed in its own tent. Details, details, details. No "roughing it" here. A few essentials for our stay. Being completely surrounded by trees, mountains, lake and sky felt extremely therapeutic. Simply sitting on the deck of our tent and gazing at Lone Peak was more than enough for us. There is something about being so captivated by mother nature that makes it easy to disconnect from our digital devices and be present in each other's company. It was almost as if time had stopped and it was solely our little family out in the world. Whether you're camping or glamping or anything in between, we found that its best not to have much of an agenda after doing all the hard work of planning and making the actual journey. Just letting yourself be guided by intuition, not wearing a watch or phone, challenging yourself to guess time by the position of the sun in the sky, and being aware of how your body is responding to the slower pace- the experience can be one big mind-clearing meditation, your very own mental detox. As the sun started to go down and the Montana sky began its nightly show, we made our way to the main campsite for dinner. Upon check-in, we had ordered the BBQ in a box for two, basically a steak dinner without any of the work. Our box came with a potato salad, pre-seasoned steak, and veggie sides. While we normally enjoy doing all of our bbq prep at home, here we simply threw the steak on the preheated grill and went to watch the sun set over the lake. When we came back to check on the steak, we realized we overcooked it slightly after getting carried away with pictures, but the small trade-off was more than okay. We took our time chowing down on steaks while the campfire got prepped. For dessert, our guide brought out s'mores for roasting- not just traditional smores (my personal favorite) but scores of s'more options with peanut butter cups (Aaron's new favorite), Kit Kat and other childhood candies. We lingered at the roaring campfire, set against the dramatic backdrop of Big Sky, for as long as Calder let us. After our faces were toasty and our bellies full, we made our way back to the warmth of our tent (the wood burning fireplace was lit and prepped while we were at dinner) and snuggled into the electric blanket tucked underneath the duvet, talking into the night like teenagers. Breakast area in the main tent. Good night and sweet dreams, Montana. While glamping can sometimes be the equivalent of a hotel room that happens to be outdoors, there are still a few things I found handy to pack and have on hand...somewhere in between having a few key items to enhance your experience but not going overboard with too much unneeded gear. Old School Games Twister, Monopoly etc. Nothing better than sitting by the furnace in your tent while the wind is whisking around outside, getting lost in a game of with your loved one(s). And that's a wrap for this post; would love to hear about your glamping experiences below- off the beaten path sites you've discovered and/or tips you realized along the way!